A paper I worked on with Matt Zook and Lomme Devriendt has just been published in Journal of Urban Technology (Vol. 18, No. 1). 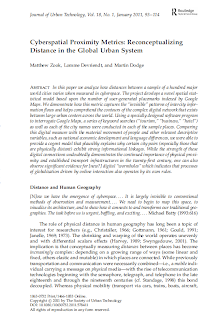 The title of the paper is: Cyberspatial Proximity Metrics - Reconceptualizing Distance in the Global Urban System. I was very much a third author on this and the key conceptualisation and all the analysis was undertaken by Matt and Lomme. Abstract: In this paper we analyze how distances between a sample of a hundred major world cities varies when measured in cyberspace. The project develops a novel spatial statistical model based upon the number of user-generated placemarks indexed by Google Maps. We demonstrate how this metric captures the “invisible” patterns of intercity information flows and helps comprehend the contours of the complex digital network that exists between large urban centers across the world. Using a specially designed software program to interrogate Google Maps, a series of keyword searches (“tourism,” “business,” “hotel”) as well as each of the city names were conducted in each of the sample places. Comparing this digital measure with the material movement of people and other relevant descriptive variables, such as national economic development and language differences, we were able to provide a cogent model that plausibly explains why certain city pairs (especially those that are physically distant) exhibit strong informational linkages. While the strength of these digital connections undoubtedly demonstrates the continued importance of physical proximity and established transport infrastructures in the twenty-first century, one can also observe significant evidence for [new?] digital “wormholes” whi ch indicates that processes of globalization driven by online interaction also operates by its own rules. Our book Code/Space: Software and Everyday Life (MIT Press) was printed a couple of weeks ago and is now shipping in the US and is just about to be published in the UK. I am pleased in many respects with the finished result and think it contains some interesting ideas and reads like a coherent argument around the significance of software in the production of the spaces of everyday living. Its a proper monograph eventhough its built from an existing set of journal papers we've published over the last five or so years. This promotional pdf flyer I put together gives more details on the book, including the table of contents, our preface and the first chapter. 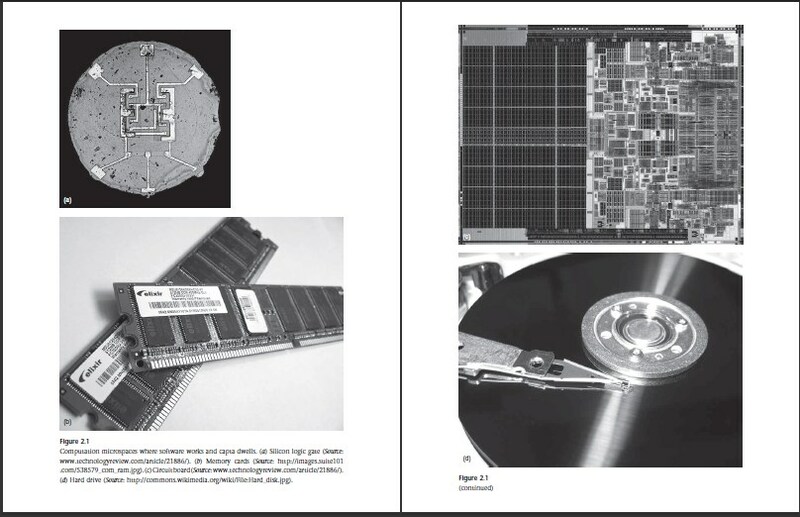 The discussion in Code/Space is perhaps a little dated in parts and lacks full empirical detail that I would have liked (if only I had had more time for digging out factual material over last couple of years). The 'heavy lifting' in the writing load on the book was defintely taken by Rob Kitchin. The book also is a bit thin physically I think - it needs an extra 50 pages or so to really feel like a substantial monograph. This is partly my fault I think for not contributing more to the last couple of chapters. I am also ambivalent about the book's dustjacket cover. The designer did a fair job with our suggestions for representing 'code' (city lights at night; close-ups of computer chips) and avoided the worst of corporate clipart and hackneyed montages; but the overall impression does seem borderline noir 'cyber' cliche from the 1990s. The most annoying issue about the book, from my perspective, is with the figures. A couple of the illustrations do not work well when printed in black and white - this is my fault. Also, several pages of figures - like the one below - have been incorrectly sized and poorly laid out by the typesetter, so they look a little duff. I have been trying in the last couple of weeks to spread the word about Code/Space and hope that the stature of MIT Press and their marketing team can work to promote the book to wide audience. It will be interesting to see what reviews we pick up from geographers and hopefully some from a wider range of social scientists and perhaps beyond. More details on the research by Rob Kitchin and myself are given on our Code/Space page. We need to do some more papers on this theme this year (I have have some draft pieces and other more speculative ideas), seek funding for in-depth empirical research and arrange for some sessions at the next AAG meeting in New York.